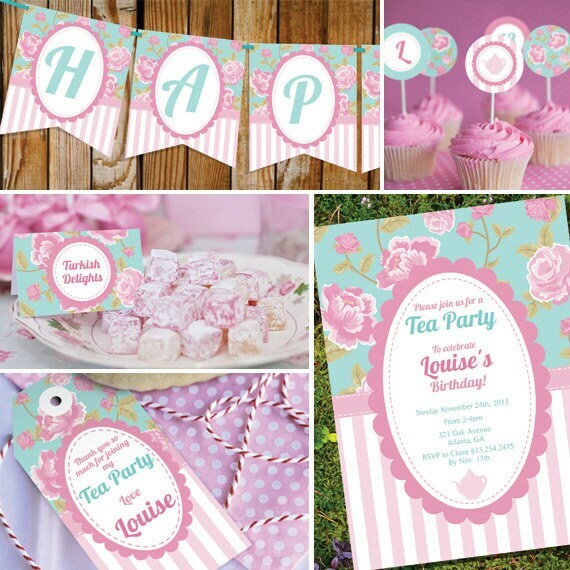 This listing is for the digital file of the full printable collection of the SHABBY CHIC TEA PARTY THEME. Banner – “HAPPY BIRTHDAY” is not editable, but editable panels are provided. This listing does not include color changes, layout changes, font resizing, cropping of template, inserting of text or printing. ► For copyright reasons these files are security protected. However if you are using the LATEST Adobe Reader for editing and printing these security features will not affect you! ► Unfortunately we DO NOT print invitations and only supply the digital files. Once you purchase the file you will receive an Instructions page with your download. If you’d like to read those now, you can find them here http://www.sunshineshabby.com/faq/ together with frequently asked questions and solutions to common problems. As items are digital in nature, we cannot offer a refund or an exchange on items already emailed. Thank-you for understanding. Thank-you for stopping by and we hope you find a great personalized party printable set for your special occasion! Housewarming BBQ Invitation - Housewarming Party - Housewarming BBQ - Instantly Downloadable and Editable File - Print at Home!